I’m always amazed by how my creative urges are influenced by the seasons, the weather and my mood. How I can enter the sweetie-shop excitement of a wool shop and on separate occasions, feel the draw of completely different yarns and colours. 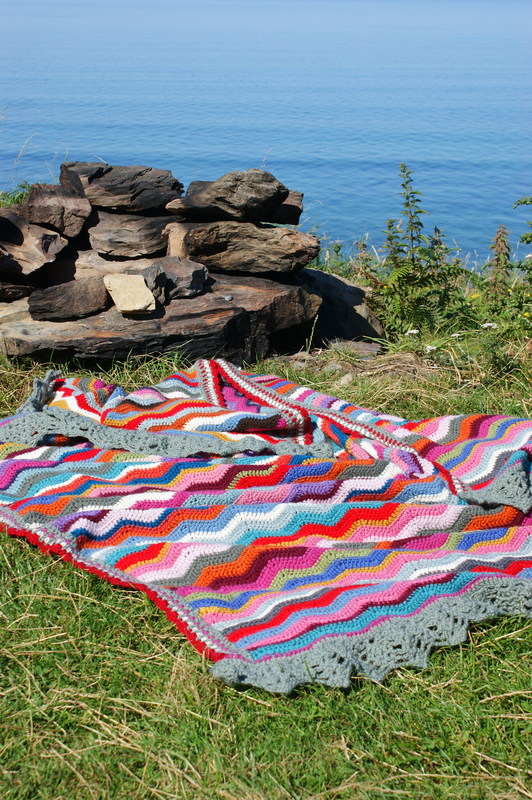 Earlier this summer, I posted here about how I expected to embark on a vibrant and colourful summer crochet project, but felt drawn to the image in my head of misty layers across a valley. 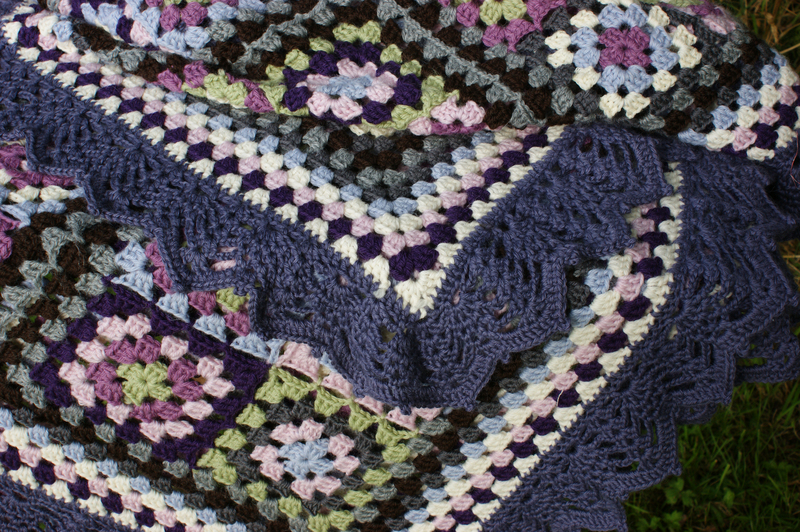 The yarn – rather drably named ‘Plum’ – is so soft and I crocheted the pineapples from memory, just chaining inbetween the pineapples to ensure the lace drapes softly. What do you think? Of course, no holiday in Dolly is complete without Ripple 1 coming along for the ride. 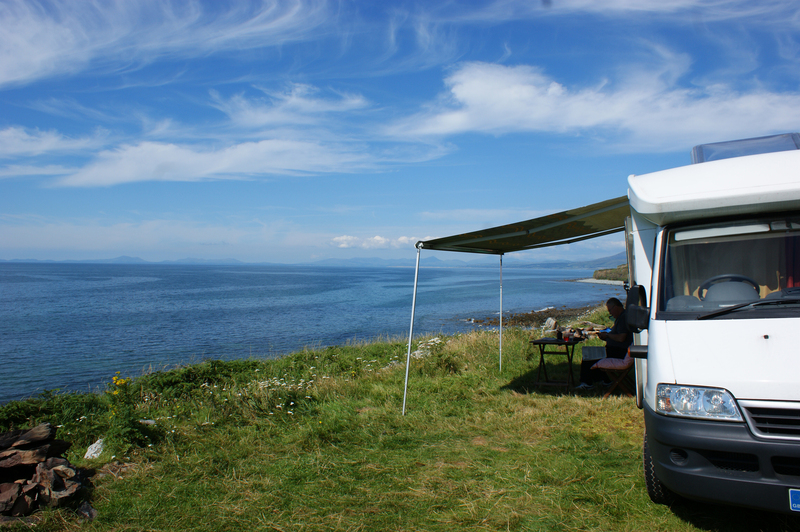 We stayed on a farm camp-site, near Aberdovey on a perfect day. 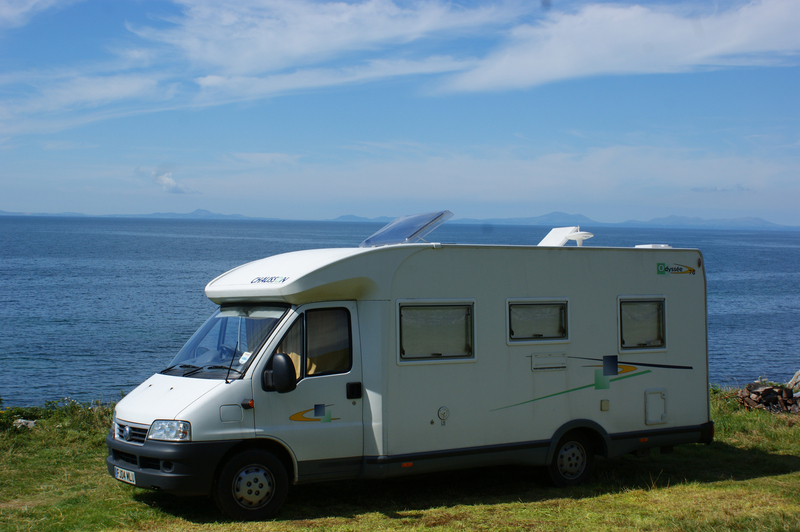 The site was very low-tech – just a field really, but with magnificent views out over the sea towards the mountains of Snowdonia and the mysteries of North Wales. 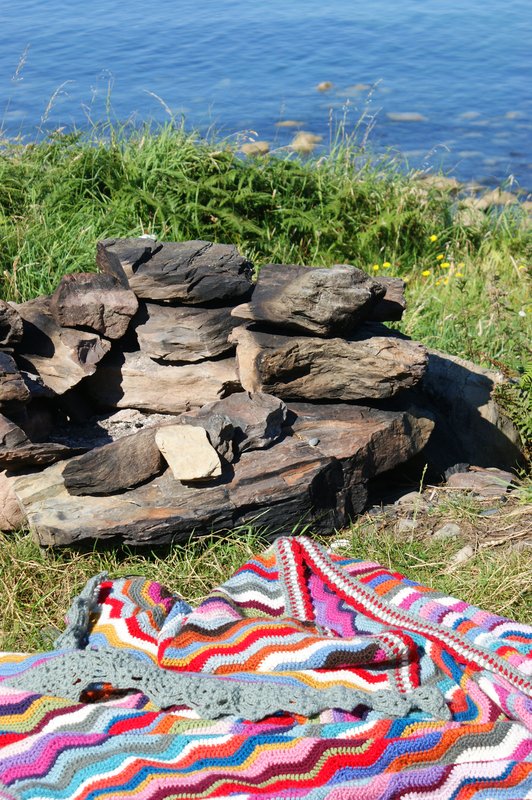 Firepits had been built from the local granite rocks beside the pitches and at night, the sea lapped onto the rocks below as the moon rose, the stars twinkled and families sat beside their camp-fires – magical. 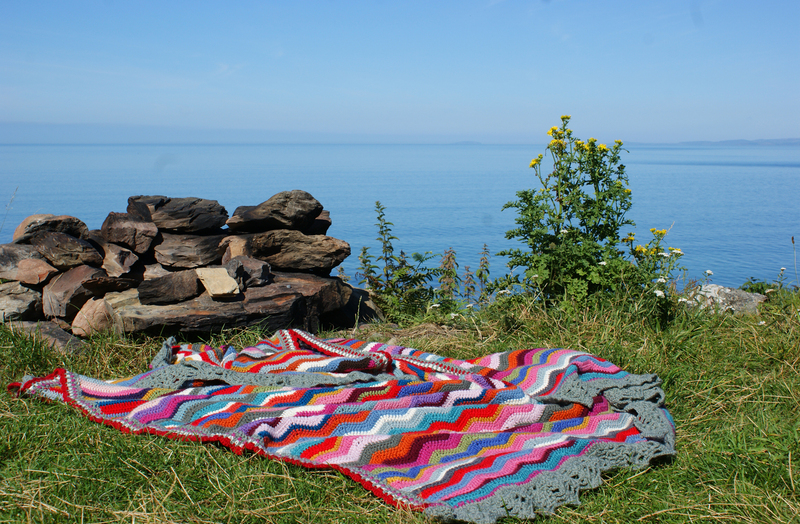 Dolly enjoyed the view and I enjoyed some sewing by the seaside which is, indeed, one of my all time favourite things to do! 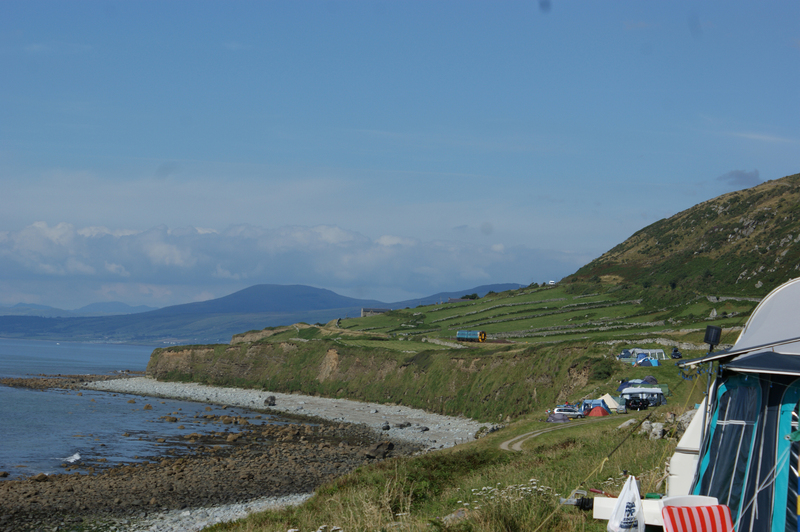 See the little train – just 2 carriages long – it travelled by rather sedately at the top of the camp-site. We were neatly sandwiched between the cliff and the railway track and everyone stopped to wave at the tourists who rumbled by every hour or so throughout the afternoon! 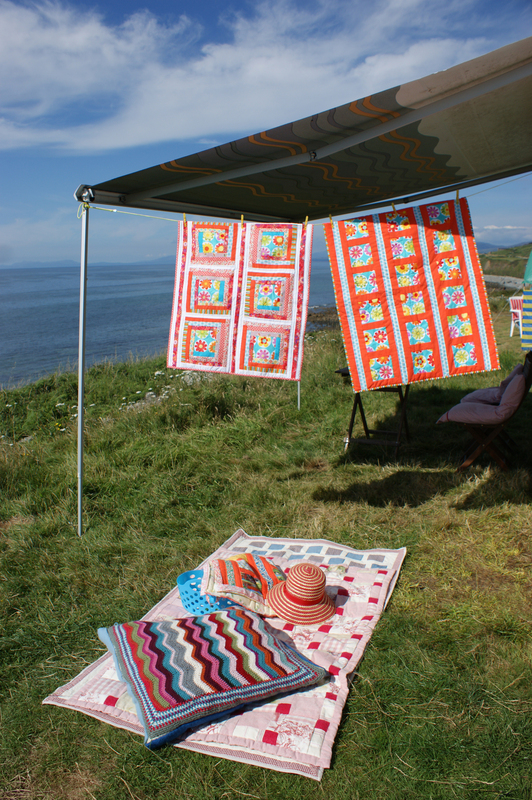 This is my most perfect place ever to sit and sew with sunhat, very large cushion, couple of quilts underfoot and freshly bound little quilts hot-off-my-needle hanging up in the sunshine as they’re completed! 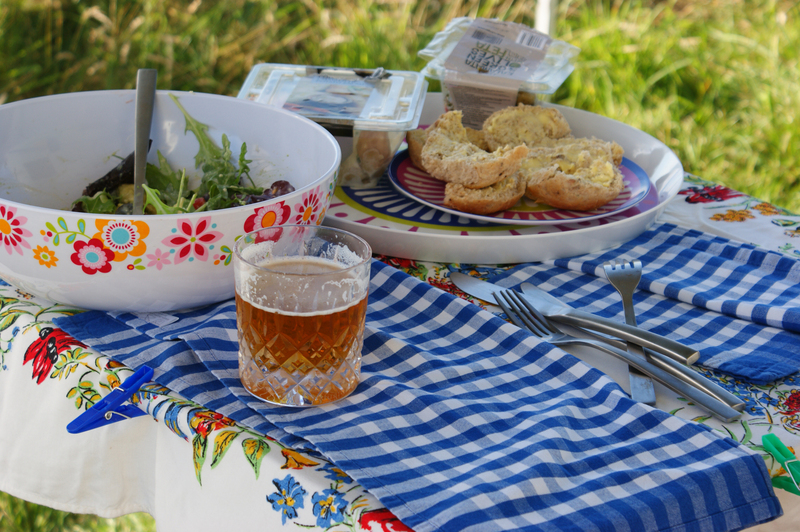 More on the summer quilts in my next post. Happy memories. 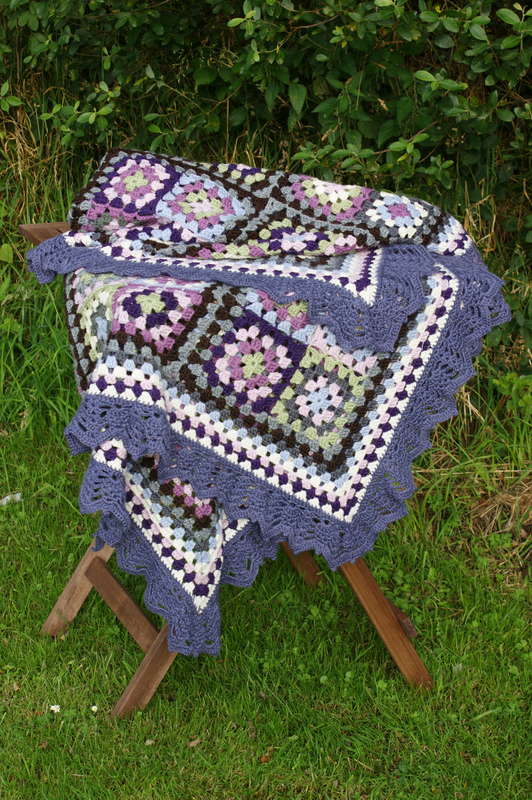 Lovely pictures and gorgeous blankets Ada! 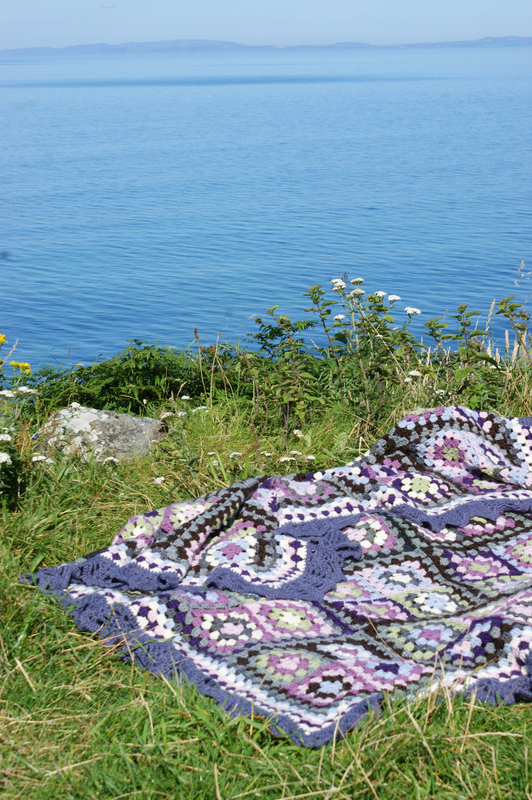 What a lovely place to visit, and what a great job you’ve done on the crochet blankets, as always! I love the borders you put on your blankets (and am very impressed that this one was from memory). Your color palette is fantastic, too. Great job! 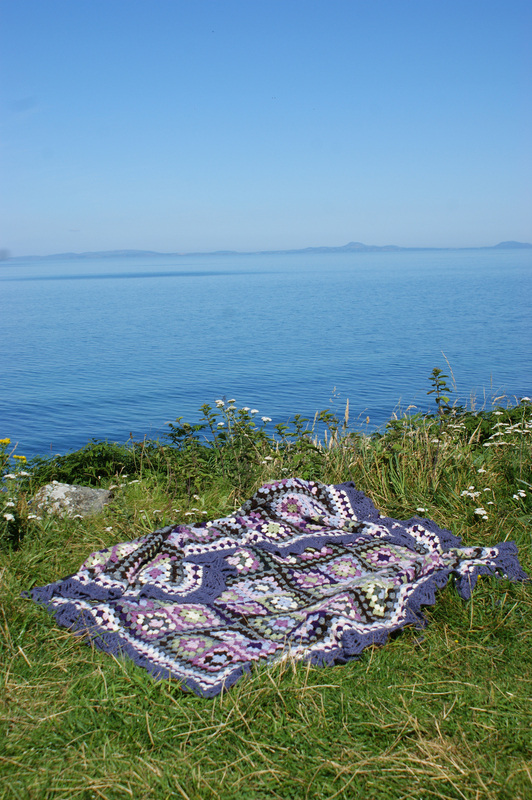 I love the purple colours – all heathery and late summer. Beautiful! Just found your site after reading Lucy’s Attic 24 blog. I love the colours of your blankets especially the misty morning one. Is there a pattern you use? I just make them up as I go along! 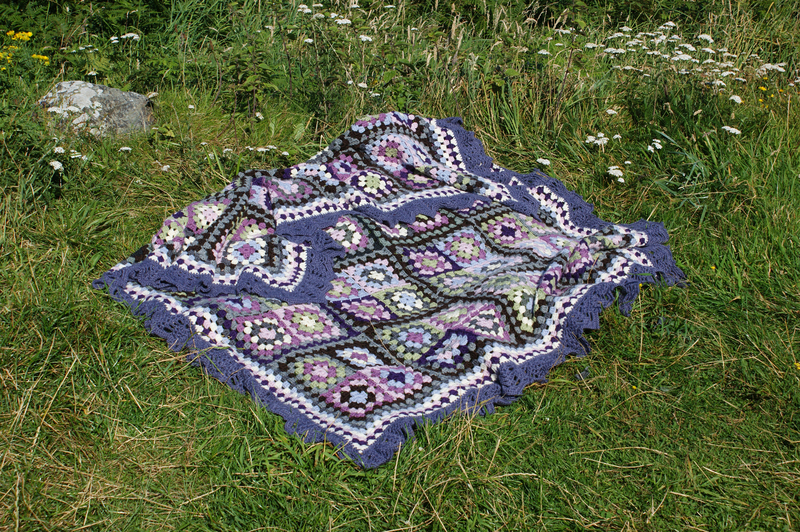 I make a lot of patchwork quilts – my website is http://www.adaliza.co.uk – my blankets are for the family only as I love working with wool as well as fabrics. Sometimes they just seem to work themselves out – no pattern needed! Glad you’ve popped over – hope you come back soon. So pleased you popped over to my site. 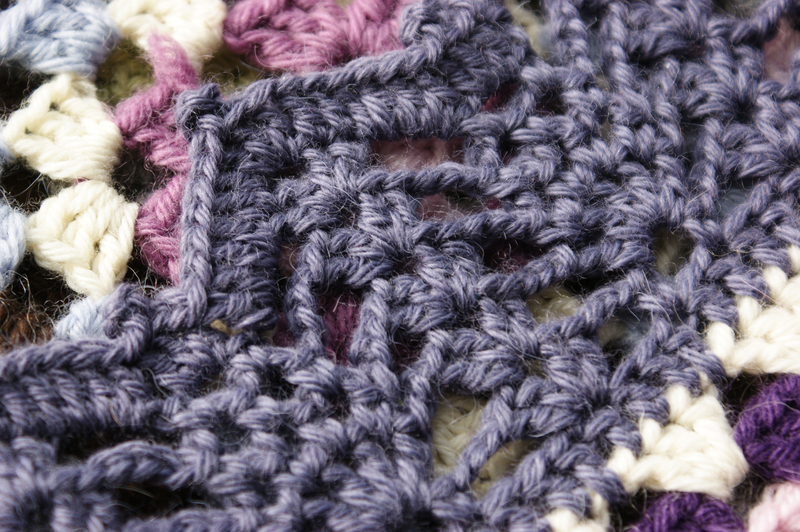 I just make my blankets up as I go along – I can’t follow a pattern and use colours that I love. It seems to work OK for me!! Hope you pop back again. Hi, not sure but just checking re photo as I am unable to see it. Thank you for agreeing to post picture. Hi Carol – I’m waiting for a day when I’m home and it isn’t raining! Sorry for the delay. I’m just about to pop a couple of photos on the Misty Morning page (taken in the rain)! You are currently reading Misty Morning : all done at Adaliza.